Awoke at 2:30am to the sound of light rain on our tent, and the sight of it collapsing on us. After checking the pegs we still secured, Linda declared “something must have fallen on it”. Something had fallen on it alright. Snow! Half a foot of the stuff caking our 3 season tent, which was in sad need of reinforcement. Curiously it was nowhere near as cold as up at Silver Lake. After finally getting back to sleep (multiple efforts at bashing the snow off our tent) I woke up to find my sleeping bag sitting in a pool of water :-(. 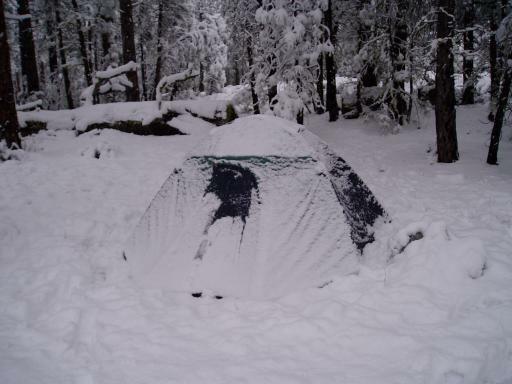 Everything was white and wondrous when we looked out the tent at first light. Bloody cold though! Lovely as it looks, it's not the best environment to try and move one's bowels. We sat in the tent waiting for it to stop snowing. No traffic noise on the road suggesting it was closed. We got so bored we made our own Scrabble set. By 11:30 it had warmed up so much the snow had turned to sleet. And by 2:00pm it had even stopped raining. We walked out to the road to see plenty of traffic and evidence it had been ploughed clean. So we quickly packed soaking possessions (only took us two hours) and walked our bikes back to the road. By the time we'd got there every conceivable moving part, and plenty that don't move, were covered in an unhealthy mix of snow, dirt and pine needles. So at the crack of 5:00pm (the time we arrived here yesterday), we were on the road. Great downhill riding with the surrounding country covered in snow. We seemed to descend for ages, and we dropped at least 500m before the snow by the road thinned out at all. Long session riding down the Hat Creek valley. As we'd decided to ration our food, we hadn't eaten breakfast and only had half a lunch today. Didn't seem to bother me too much, but Linda conked out within 10km of the finish, requiring an extended roadside break in a belting rain storm with just a touch of hail. Very happy to see the bright lights of Burney, which incredibly is even less alluring than it's Tasmanian namesake. Tried to walk to the diner for some much needed refueling, but before we could walk the 75m required another huge rainstorm dumped 3” of rain and 2” of sleet over anything and everything.